Conveying Awareness with Jessica David: DIY Foot Spray & Powder with 5 Ingredients! My son is back in gymnastics. After two sessions on the mats with bare feet, I thought about needing to make a foot spray to reduce the chances for bacteria (fungus) to take up residence in my son's shoes. 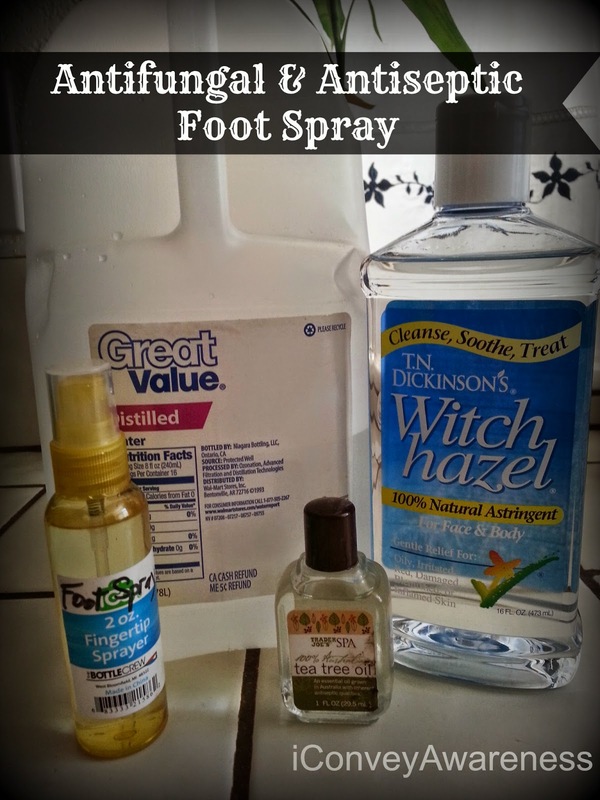 So, I asked two friends, Stacia of Tehacha-Bee and Jessica of Scratch Mommy what was the best way to make a safe and effective liquid foot spray. They both suggested using distilled water, witch hazel, and tea tree oil in a spray bottle. Since the oil separates from the water it would need to be shaken before application. We have used the spray a couple times already and it'll be my go-to until I learn of a better way. If you have a recommendation, feel free to leave it in the comments. I filled the spray bottle to the almost half way point with the distilled water and then filled it to the almost full point with the witch hazel. I added 5-8 drops of the tea tree oil. That's it! Shake before applying and fan to dry. A liquid foot spray is ideal for sports where bare feet is mandatory but having a foot powder is equally important especially if you've got kids whose feet sweat a lot! This recipe is using 2 ingredients and a shaker cup. I really wanted to find these cups locally but I settled for the one pictured. It's small enough to fit in my purse but having one slightly larger will allow me to use the ingredients more generously. 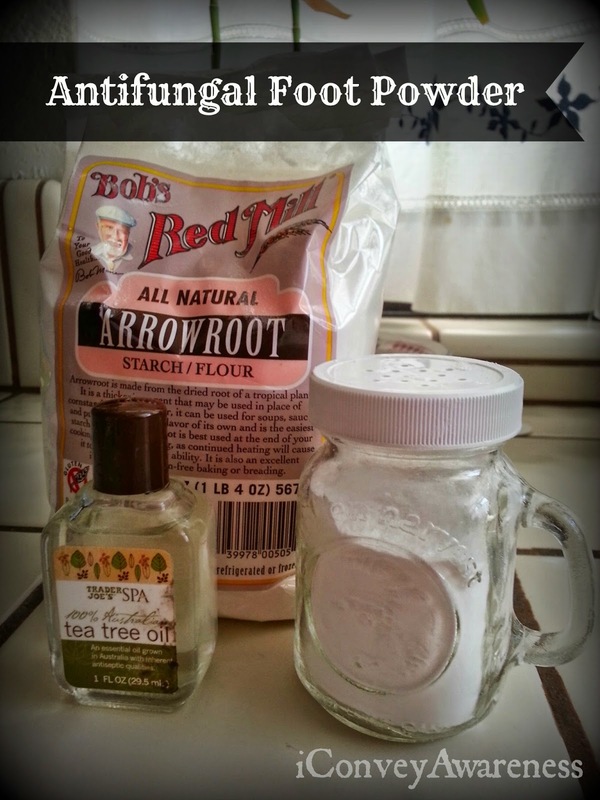 Fill the container to the almost full line with arrowroot powder and add about 10 drops of Tea Tree oil. Secure the lid and place your palm over the top while you shake vigorously to mix the oil with the powder. You can always add another oil to make it smell differently. I recommend lavender for its numerous benefits and it's one of the most versatile oils IMO. You're invited to share your own DIY foot spray and powder recipes or if you use mine, be sure to come back and leave your experience as a comment. Note: Though these recipes are safer than most store bought products, it's still important to ensure that you keep them out of reach of children and avoid using near the eyes and mouth. Sharon, the DIY inspiration is around every corner. I bet you could share some great recipes with me! I have recently (in the last 2 years) started making more and more on my own. Wouldn't you agree that there's some level of empowerment when you can make your own? I might have to try the foot powder for my oldest dd, who has some smelly foot issues. Thanks for sharing this on Merry Monday. I like to sound of the foot spray. I love the smell of Tee Trea oil. I bet it is awesome for feet! Have to give it a try. I have teenage boys who really need a natural foot powder spray. Awesome recipe, thank you! Kids, mainly boys play hard so they need the freshener without the unknowns. I hope either recipe works for you! After watching my husband struggle with all kinds of harsh, toxic, smelly products for his foot fungus, I am delighted that you shared these two safe, natural remedies for foot care with us at the Healthy, Happy, Green and Natural Party Blog Hop! We appreciate it! I can't wait to make them for my family.